Poems often shape our very being, connecting us to the world beneath and beyond us. Sometimes we get this ethereal feeling when we find ourselves around nature, people, places, possibilities, and find ourselves in it. Anindita Bose, a poet herself shares her experience of reading Daipayan Nair's beautiful poem volume " The Frost". As the name suggests it is a world where one gets to know his perspective often delving into romanticism. Love is beyond thoughts and expressions but words tend to bleed out the heart and pen down verses revealing its secrets. It can be different for different hearts but it is love overall connecting our senses to the soul of the world. 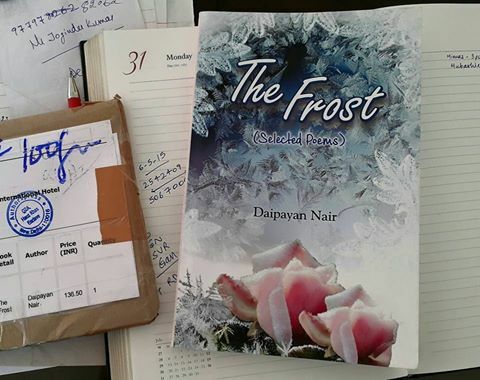 While reading Mr. Daipayan Nair’s ‘The Frost’, a poetry lover like me could feel my feet taking me to this mystical world of romanticism. An ancient world, which inspired and continues to inspire the writers of many generations; the lyrical poems took me on a journey where I saw images of a Latin poet of the late Roman Republic revealing his heart out. Gaius Valerius Catullus wrote in the neoteric style of poetry and he inspired poets such as Ovid, Horace and Virgil, and his love poems on the ‘Lesbia’ explored various frames of love affairs. I felt Daipayan's poems on love and passion could inspire generations to think about emotions in the light of soulful imagery and axioms.The lines of each poem are painted with such thoughtful perceptions that reveal different stories, which exist in this world between millions of human beings. Each story experienced perhaps by different people or by same ones in separate relationships. Mr. Nair has focused on the value of love and companionship, which is an earnest desire of the entire universe presently clouded in materialistic ambitions about love. I am delighted to read such array of versatile love poems, a subject always under discussion. But there is something different in these contemporary modern love poems of our time, I am sure the book has more meanings and layers to it. I wish success for Mr. Daipayan Nair and look forward to his next volume of love poems. It makes me believe in love again and again. We hope you could find yourselves the time to pen poems yourselves or if you are looking for inspiration, then this book just might do the trick. We were indeed delighted to read his poems.